So we've planned our to go for a ride, and we've organised where we're going to stop; we're ready to meet up with the group. However, before we mount up, we should always take a couple of minutes to stop and take a moment to prepare. 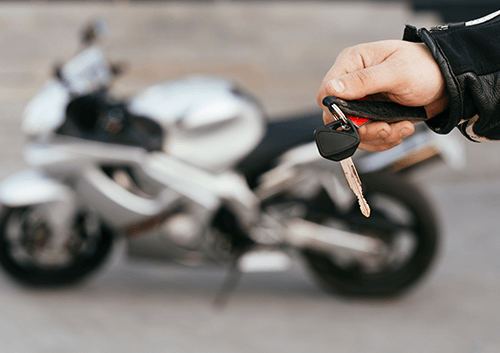 The building excitement of those last few minutes as we roll the bike out of the garage and prepare to ride off means that we often neglect to carry out those simple little checks that could save our lives. Riding a motorbike is not like driving a car where is something goes wrong with the engine, then the worst that can happen is that you roll to a stop. If a tyre fails, then there are at least another three. The last minute walk round before mounting your bike achieves a couple of important things; it focuses the mind on what we're about to do when we ride out on our powerful two-wheeled machine, and it enables us to take one last careful look at those parts of the bike that can go wrong. Not being in the right frame of mind to ride is a genuine danger. Try to forget all those niggly things in life that take our attention away from the road; never be in a rush and never plan what we're going to do when we get to the office. The next part of the walk around should focus the mind a little and helps to put us in the right frame of mind. The ride needs all of our attention. Have you ever watched an airline pilot doing his pre-flight checks before take off? He does everyone methodically and thoroughly - and he does them every single time he flies and logs every check. While we may not be hauling a couple of hundred people a mile up into the sky when we go for a ride, and we don't have quite so many buttons and toggles to play with, we are about to put ourselves in a place where the risks are high. So what are we looking for with this check? Remember that this is largely a visual check; put the bike on the centre stand (if you have one, of course) and check the surfaces of both tyres….all the way around. If you've only got a side stand, then check what you can see of the tyres before rolling the bike forwards and looking at the rest of the tyre. You're looking for anything stuck in the tread, unusual wear patterns or cracks in the sidewalls. Finding a nail in your tyre is never a pleasant thing, but much better when it's on your drive than when you've just cranked your bike up on the motorway slip road. If it's been a while since you last checked the tyre pressures, then now is the time check them. Low air pressure in a tyre can have very ugly effects on the bikes handling which doesn't usually become apparent until you're up to speed. Motorbike tyres usually have pretty strong sidewalls, so kicking them or pushing them with your fingers won't tell you anything. Check the fork stanchions for leaks around the seals. Again, this isn't a major factor, but if you're about to ride a sports bike on a challenging route, a leaking seal will have a negative effect on the handling. Is the chain sagging? Is it lubed? These are relatively small things, but they all need to be kept within the correct tolerances. Dry chains, eat sprockets quickly and sagging chains will eventually come off and lock up the rear wheel. 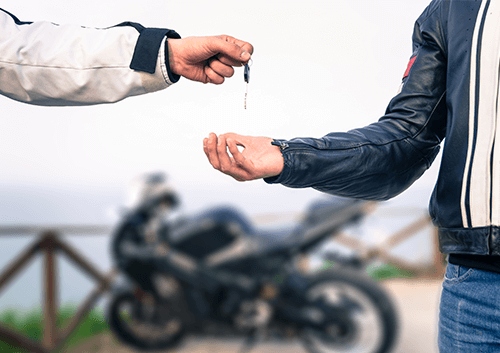 Common wisdom is that you check them every third fill up at the petrol station, but if you get into the habit of the routine check every time you the bike out, then you won't have to count petrol stations. If you're not sure what the correct amount of sag should be, then refer to your user manual. Next, turn the engine on and check the lights - especially the brake light. 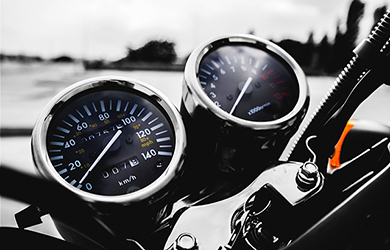 Motorcycles have a far greater ability than cars to slow down using the engine alone and, unless you're really in a hurry, brakes barely need to be applied in normal riding. However, this isn't always best for following vehicles - if someone is too close and you are using your engine to brake, it could well mean them running up your rear. In these circumstances, it is often a good idea to touch the brake so that the light comes on. But of course, it has to be working. Checking the brake light also doubles as a check to see that you have pressure in the braking system - another fault that it is too late to discover at the end of the drive. With regards to brakes, it is also important to check your brake pads. They take a long time to wear )especially when we don't use them much), but it doesn't mean they should be ignored. A badly worn pad will score your disc and double the costs of replacement. With the engine running do a visual check for any oil water or other fluid leaks. Check the radiator hoses for white marks which indicate a loss of fluid. Rev the engine to check it sounds right - are all the plugs firing? Finally, check any fairing pieces you might have. 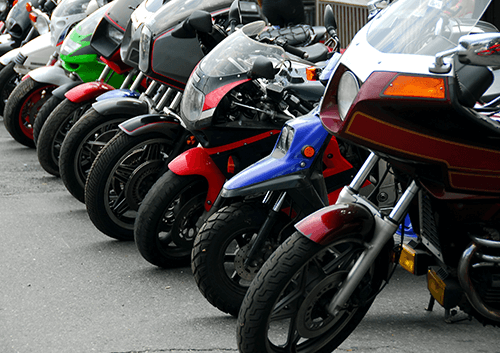 There are plenty of vibrations on a bike that can slowly loosen fairing fixings; sourcing them can be quite a pain if they work loose and fall off. Little things, yes, but every one is a potentially life-threatening hazard if not spotted early. Be safe - take that minute or two to walk around before every ride. The first time you do it, it might take some time, but, like the airline pilot, you will get into the habit of checking everything, and it will become second nature. You'll also put yourself in the right mindset for the ride ahead. The walkabout could ultimately save your life.